Sorry everyone...I just had to put that title in there! In addition, with a name like the Squiggy Classic, and in our efforts to bring you the best Tampa Bay area events out there, I just had to share this information with you! The 5th Annual Classic Fitness Festival will arrive in Hillsborough County’s Wilderness Park on March 13-15 to test participants’ athletic skills in one of the most beautiful natural environments in the Tampa Bay area. 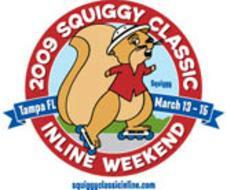 The annual “Squiggy Classic” is a three-day fitness festival for active outdoor enthusiasts that includes trail runs, mountain bike races, road cycling events, adventure races, inline skating and a night canoe paddle. Interested in participating???!!!! Potential participants can call 813-987-6211 or visit www.squiggyclassic.org for event schedules and registration information; entry fees vary per event. Plus, proceeds from the event benefit Friends of the County Parks, a 501(c)(3) not-for-profit organization that provides financial support to the Hillsborough County Parks, Recreation and Conservation Department. It&apos;s not the beautiful Tampa Bay area beaches, but this is some great Tampa Bay entertainment to enjoy, so head out and enjoy! I&apos;ll be busy with the SEC Basketball tournament, so I can&apos;t be out there, but let us know if you plan on attending! I hear it&apos;s going to be a great time, so make sure you at least stop by, if only on your way to SEC fanfare.